The backstop is not just about trade and cross-border checks, says Niall Ó Dochartaigh (National University of Ireland, Galway). It specifically mentions North-South co-operation and the Good Friday Agreement. The British government’s proposals for ‘alternative agreements’ do not acknowledge how vital these elements are. When people invoke the backstop in the Withdrawal Agreement, they often focus on the issue of movement of goods across the Irish border or, even more narrowly, on physical infrastructure and checks at the border. But the backstop is about much more than this. This is particularly important now that the Commons has voted to support the Brady amendment which ‘requires the Northern Ireland backstop to be replaced with alternative arrangements to avoid a hard border’. Although the EU has refused to reopen negotiations on the backstop, it is clear that many MPs would like it to be watered down to make it easier to secure the support of hard Brexiteers and the DUP. There has been juch talk of ‘technological solutions’ but the WA does not separate out technical arrangements to deal with cross-border movement from the broader aims of the backstop. 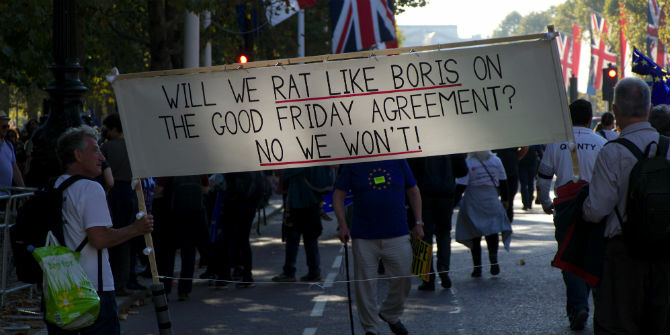 Where the Withdrawal Agreement mentions a ‘hard border’, it usually does so in one breath with protection of North-South cooperation and the Good Friday Agreement (GFA), rather than as a separate issue. sets out arrangements necessary to address the unique circumstances on the island of Ireland, maintain the necessary conditions for continued North-South cooperation, avoid a hard border and protect the 1998 Agreement in all its dimensions. Note the word ‘including’. The UK government guarantees to avoid a hard border ‘including any physical infrastructure or related checks and control’. It serves to emphasise that a ‘hard border’ does not just refer to physical infrastructure and related checks. Which makes sense when we consider that the aim of avoiding a hard border is firmly characterised in the document as part of a broader set of goals that include protecting the GFA and North South cooperation. Any further development of these arrangements to be by agreement in the Council and with the specific endorsement of the Northern Ireland Assembly and Oireachtas [the Irish parliament], subject to the extent of the competences and responsibility of the two Administrations. ‘…the need for this Protocol to be implemented so as to maintain the necessary conditions for continued North-South cooperation, including for possible new arrangements in accordance with the 1998 Agreement’. The next mention of the ‘hard border’ in the Withdrawal Agreement similarly locates it within a broader set of linked aims when it recalls ‘three different scenarios for protecting North-South cooperation and avoiding a hard border’ that were discussed in 2017. ‘This Protocol’, it continues ‘is based on the third scenario of maintaining full alignment with those rules of the Union’s internal market and the customs union which, now or in the future, support North-South cooperation, the all-island economy and the protection of the 1998 Agreement”. Here again, support for the GFA and for North-South cooperation are presented as central goals of the protocol, along with ‘the all-island economy’. The detailed measures laid out in the protocol deal in large part with technical issues around cross-border movement of goods, but the opening statements make clear that the purpose of these technical arrangements is to achieve a broader set of linked goals. When Taoiseach Leo Varadkar describes the backstop as ‘a guarantee that there be no hard border between Ireland and Northern Ireland’, he is not abandoning the set of aims in the Withdrawal Agreement of which it is a part. Instead it is used by him and others as a shorthand for the linked goals of ‘supporting North-South cooperation, the all-island economy and the protection of the 1998 Agreement’. There is much more at stake in the protocol than the focus on cross-border movement might suggest. Ultimately the protocol seeks to protect the close and open-ended relationship between Northern Ireland and the Republic of Ireland established by the Good Friday Agreement. Niall Ó Dochartaigh is a Personal Professor of Political Science and Sociology at National University of Ireland Galway.